DriverMAGIC will help you maintain your computers drivers easily and efficiently, using the latest driver technology to identify and source your new drivers for any operating system.DriverMagic has been designed to be as quick and easy to use as possible, everything is automatically managed by DriverMagic and all you basically have to do is click that next button every now and then. It makes sure you get nothing but the best drivers downloads. ...... in the fact that your computer is running the most efficiently and reliably it possibly can. Each driver listed in our comprehensive search engine is tested by one of our experienced driver technicians and has our quality stamp of approval. DriverMagic has been designed to be as quick and easy to use as possible, everything is automatically managed by DriverMagic and all you basically have to do is click that next button every now and then. 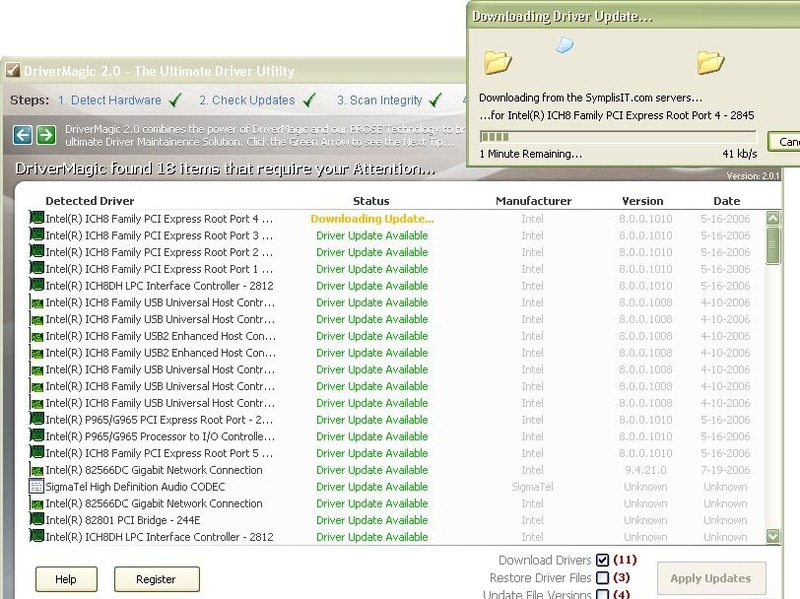 Drivers are updated weekly to make sure you get nothing but the best and latest drivers, all older drivers are removed the minute new drivers are available for each device listed, this means that some driver may seam the same, but support different hardware, DriverMAGIC Pro accounts for this and makes sure you get nothing but the best drivers downloads. Qweas is providing links to DriverMagic 2.0.8 as a courtesy, and makes no representations regarding DriverMagic or any other applications or any information related thereto. Any questions, complaints or claims regarding this application DriverMagic 2.0.8 must be directed to the appropriate software vendor. You may click the publisher link of DriverMagic on the top of this page to get more details about the vendor.